"Heritage" provides the listening audience with a well-rounded taste of Jewish Choral music, ranging from lighthearted Yiddish musical theater tunes, to heart wrenching Ladino melodies, and soaring majestic harmonies of the early Jewish liturgical music. Music is the soul of the Jewish people. Our lives are touched by music continuously, and our people have been involved with music since the beginning of time. When King Saul was melancholy, he was cheered by the music of David, the shepherd. When King David wrote the Psalms he instructed a conductor to put them to music. King Solomon, the wisest of all men, culminated his writings with the Song of Songs. Music has been a part of our liturgy since biblical times. We have praised Hashem with song through good times and bad. From the haunting Kol Nidre of the Yom Kippur service to the happy Nigunim of the Chasidic movement, our mood and the mood of our Jewish Holy Days have been captured in song. We have a rich tradition of cantors and choirs that goes back many centuries, but this is lost to much of the current generation. Jewish music has not been confined to our prayers and synagogue services. Yiddish melodies expressed the undaunting spirit of our people through years of hardship in Eastern Europe. Klezmer has thrilled people of all religions over the past century. Our Sephardic community has developed a vibrant style all of its own and their Ladino music is enthralling in its versatility and beauty. Secular Hebrew songs became the stalwart of the pioneer movement in the early 20th century in Israel and have blossomed into a wellspring of modern styles which sing of hope, peace and security for the State of Israel. It is with this rich tradition of music, that the San Diego Jewish Men’s Choir was formed more than 15 years ago. Dr. Basil Abramowitz garnered the services of Rhoda Gaylis, our director emeritus and we now are a solid group of more than 25 volunteers from all walks of life and varying ages singing a variety of styles and genres of Jewish music in the Hebrew, Ladino, Yiddish and English languages. The members share a common goal, the preservation and promotion of Jewish choral music. They fulfill this mission through concerts, recordings, community outreach events, and appearances at festivals. The choir is affiliated with the Center for Jewish Culture and Creativity in Los Angeles, a non-profit organization sharing similar goals. Under the musical direction of Ruth Weber, the men’s choir presents over 30 concerts a year throughout the Southern California area. Part of the proceeds from the sale of each album goes towards distributing free CD’s of this music to Jewish senior homes, senior centers, and religious schools throughout the U.S. so that the music can be enjoyed for generations to come. THE SAN DIEGO JEWISH WORLD hailed their release concert ,"Chanukah JAM proves to be a sweet confection..Hopefully, this will become an annual event. 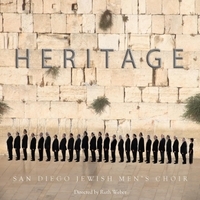 This program also launched the San Diego Men’s Choir’s inaugural recording, Heritage... now under the direction of Ruth Weber, (SDJMC) is obviously a group with strong camaraderie, and boasts some fine voices." THE OCEANSIDE YIDDISH CLUB, "thank you for bringing us one of the best afternoons of entertainment we have ever had."